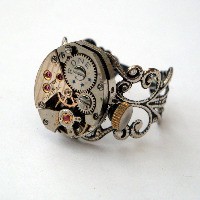 Steampunk jewellery is full of watch movements and pocket watch cogs - mechanical pieces intermingled with the Victorian fascination with insects, wings and underwater creatures. 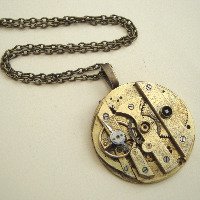 I have sourced vintage watches and pocket watches, mounted them as Steampunk rings or watch movement cufflinks, attached them to chains for Steampunk necklaces as one whole pocket watch movement with exposed cogs & gears, or taken broken pieces and collaged them with embellishments for a unique design. 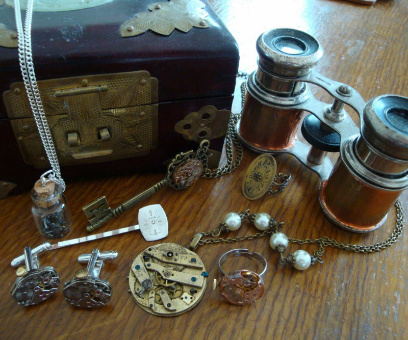 Take a look and be transported to a bygone era! 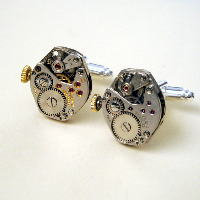 Here's Wikipedia's answer: "Steampunk is a sub-genre of fantasy and speculative fiction. The term denotes works set in an era or world where steam power is still widely used—usually the 19th century, and often Victorian era England—but with prominent elements of either science fiction or fantasy, such as fictional technological inventions like those found in the works of H. G. Wells and Jules Verne, or real technological developments like the computer occurring at an earlier date."